Home » Fashion » Bags » Hej! Will this Classic Gaston Luga Backpack suit your lifestyle as it does mine? How big is the Gaston Luga Classic Backpack? I tried to find a point of reference, but there wasn’t a lot of information online. In most photos, it looks like a reasonable, fairly compact size. The dimensions given are 28 x 42 x 14 cm and 15 litres but I couldn’t visualize that. In reality, it’s actually quite large! So, I thought it would be useful to show you visually, just how big it is. The Classic backpack is primarily canvas, with canvas straps, canvas body and canvas flap. The decorative straps and handles are smooth, thick leather. The reason I picked this design was because the flap was canvas. What this meant for me, is that I could stuff the bag to the brim (which I have) and the flap would still cover the opening nicely without creasing or bulging. The other designs boast a leather flap, which look more fashion forward, but which do not look as good, once your bag is filled. I’m a practical one, me 😀 However, the Classic backpack is more casual in design and fits a more casual surrounding, compared to the other designs. I’m particularly taken by the Classy Black design, that has gold hardware. Looks sleek! 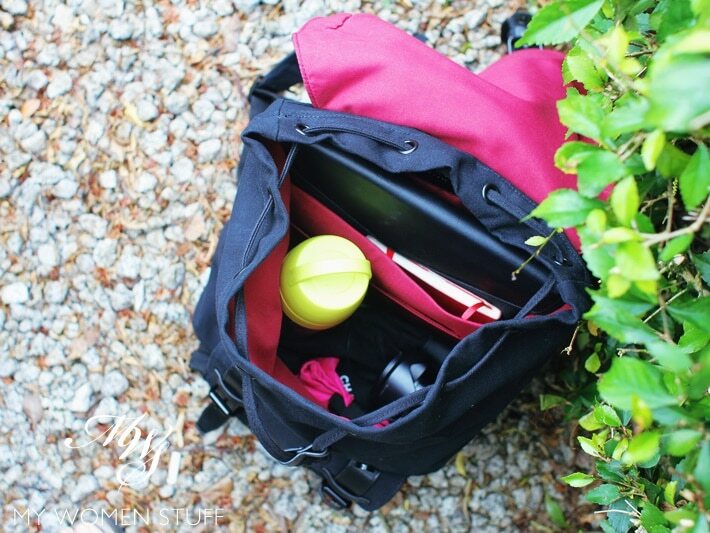 What fits in the Gaston Luga Classic Backpack? Well, a ton! I’d be happy to take this as carry on luggage or even for an overnight or weekend trip if I wanted to (I am quite a light packer) You could fit a couple of changes of clothes (in the tropics, that usually means shorts and light T-shirts) together with a small toiletry pouch, and some other bits and bobs. But for everyday, here’s an example of what I can fit in mine. There is space for more, if I wanted to stuff in more things. But this would be for starters. It also fits my DSLR camera very comfortably, and because the interior is padded, it cushions it quite well. I like that it fits my tall water bottle very easily, while still leaving space for lots of other things, because my other casual backpack fills up quickly. Here’s everything in the picture above, packed into the backpack. You can see that it’s quite compact. I love that the interior is a lovely warm, deep red canvas, which makes it easier to see your things inside. Black would just drown everything and turn it into a black hole. Also, the red contrasts prettily with the black! There is a compartment at the back, which fits your laptop (up to 15″ should not be an issue). I carry mine in its case and it slips in and out easily. I also place my large Moleskine planner in there. There are 2 more smaller pockets where you can put pens and smaller items. The front is the main, large compartment and it closes with a drawstring closure. I have to show you a hidden pocket at the back, which is actually very handy. It is a slash pocket, that sits on the back, and will lie against your back. It will fit your passport, which makes it handy space to have it when you travel, and at airports, as it will lie against your back. It also fits my phone, which has a 5.5″ screen, and the whole phone will lie hidden. Any larger phone will be a tight squeeze. There is also a little pocket in the front that closes with a zip and a flap. I’d put little items in there, but because it sits on the outside of the bag, I’d not put any valuables, just to be safe. Is a drawstring closure safe? When I showed this backpack on Instagram stories a little while ago, I had many people ask me if the drawstring closure was safe. 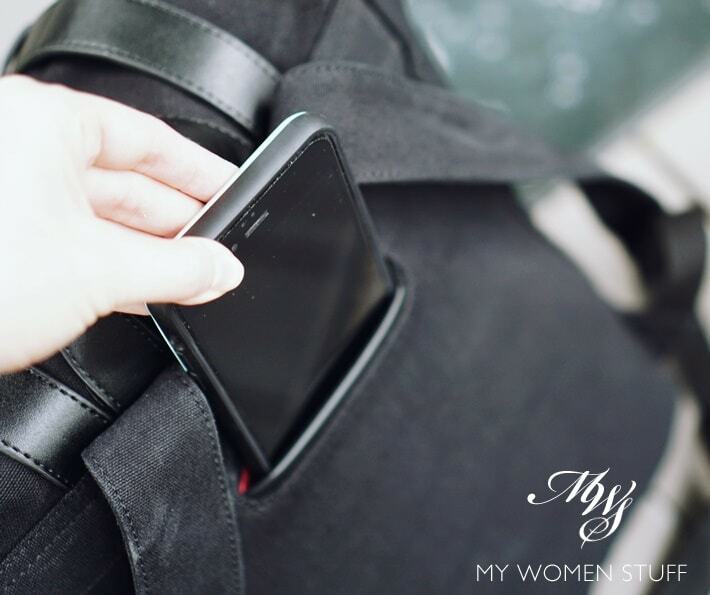 We are quite used to a zip closure being safer, and I left backpacks with drawstring closures back in school! Well, there are a few elements to this. First, I find that the drawstring closure is better than a zip closure, because it allows you more flexibility in filling up your bag. So, if you fill it to the brim, you can still close it. Secondly, the flap secures with 2 magnets on the front, and I found the magnets incredibly strong. I have a problem opening it in a hurry, which can be a good thing. One note about the material, is that dirt and dust will show up easily on the black canvas in the design you see here. Also, I think the black may be prone to fading a little, rather like denim jeans. You can see in some of the more close up pictures above, what I mean. For this reason, I’d suggest you pick one of the other colours e.g. Blue or Olive unless you don’t mind this happening. I don’t, as I don’t mind a weathered look. Is the Gaston Luga Classic backpack comfortable? The straps are unpadded canvas, but wide enough to be fairly comfortable when strapped on, even when weighed down. In this sense, I prefer it to the one I was using before, with its thin straps. Once you adjust the length of the straps to sit at the right height, it is quite comfortable. PB eating… always eating even when on the go! However, I do realise that it is quite heavy. I feel that this is due to the sturdy and thick canvas used in the making of the Gaston Luga backpack, and the leather straps. I don’t know if the other designs might weigh less, but on its own, the Gaston Luga Classic backpack is fairly weighty. Once I put my things in there, I do feel the weight on my shoulders and back. For this reason, I don’t know how practical it will be for travel, as I do prefer to travel light. But I can’t say till I’ve tried. If you’re interested in these backpacks, you can buy them directly from Gaston Luga website. For those shipping outside the EU (that’s especially so for those of us in Malaysia) the Swedish VAT (currently 20%) is automatically deducted from the price of the item. After that, you can use my promotion code “PARISB15” for an additional 15% discount (I don’t get any money from this but I’ll love you for it! 🙂 ). LIMITED SEASONAL OFFER: A FREE leather luggage tag will be added to all orders of backpacks while stocks last! They will ship by courier service for free all the way from Sweden. I wasn’t charged any customs taxes, and it arrived to me in just about 3 days which is very speedy! That said, the price of these backpacks are a little on the steep side. 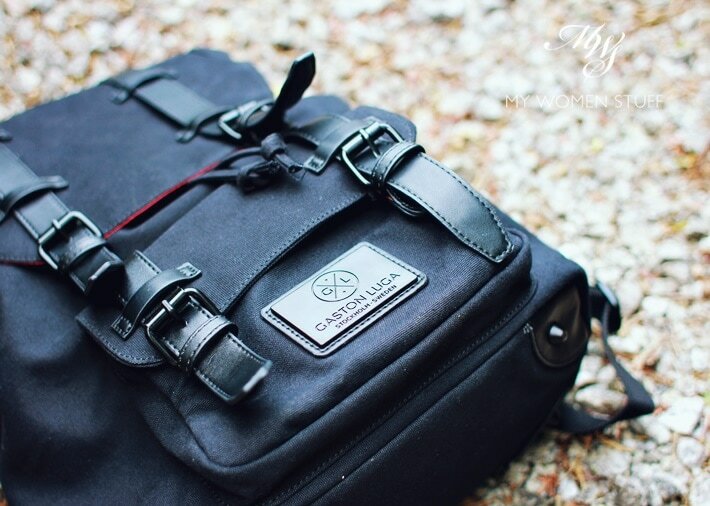 The Classic backpack that I’ve featured here is listed as RM919 (US$229) on the website. Once you deduct the 20% VAT and use the 15% discount code PARISB15, it comes down to RM624.92 (US$155.72). A good saving, but still a little steep for our local economy. You are billed in your local currency, which is good because it is an accurate representation of price. 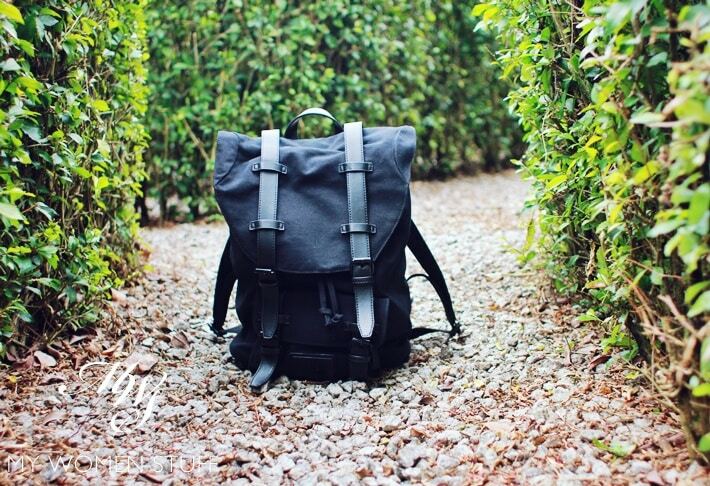 Do the Gaston Luga backpack designs appeal to you? Do you use backpacks? PREVIOUS POST: Your Say: Have you seen your dentist recently? Do you use an interdental brush? Hi SK, from what I can tell, there’s no expiry date! 😀 Are you eyeing one of them? Ooh I hope you receive yours safely soon, and that you love it *fingers crossed* Which design did you pick? I got this from them: We’re very sorry to inform you that the below item(s) of your order are backordered at the moment. As we do apologize for the delay, we will send you 2 leather address tags along with the item you have ordered. Having had a chance to play with it IRL I think commuting men would love this. It can comfortably hold their laptops and gadgets in place and slinging this as a suit wouldn’t leave you THAT out of place. If I was toting a laptop around, I’d prefer a sling laptop bag- just because it looks better ? Ps- WHAT WERE YOU EATING?!?! I love backpack as I feel more secured going shopping it and can pack lots of things plus good for my body as long as i properly use its dual straps hehe. I prefer smaller size compare to the one you featured here for my daily use. 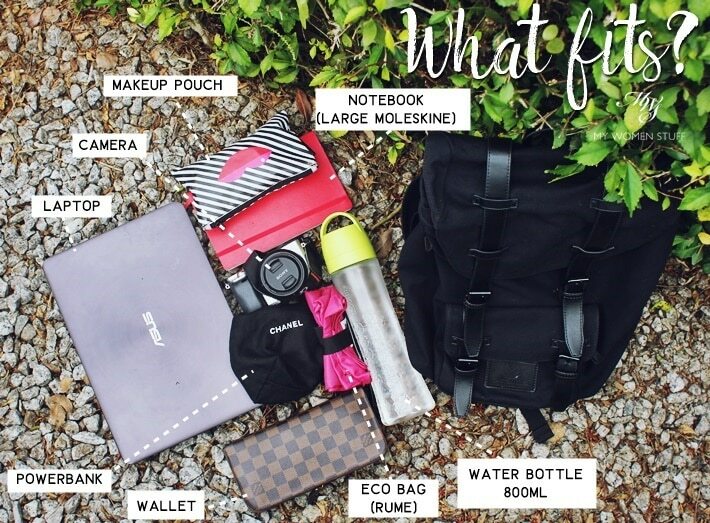 I only use bigger size if I need to carry laptop during trips – I rarely do – or during travelling which I somehow carry so many things that I need to handcarry lol. I do love the colours – black with the striking pink inside. I don’t mind if the colour get faded over time. The strap reminds me of Herschel bags, but this one is huge!